This morning I talked with nicubunu as we do each day, and he informed me that it is time to vote again, in fact he wrote an article for our website about this. The FamSCO choices were for me the hardest, because among the two stars Max and Joerg that will probably win, I gave my vote to tatica (I'm a fan). In my opinion the most popular fedora ambassador and I say this because she is in all the pictures with all the geeks all the time. So best of luck tatica. LOOOOL... Thanks for yout vote, this is so funny. Maybe I'm a really social person and if I can make people help doing all the crazy stuff I do... I'll keep doing it. Not necessarily confused, but if you are charismatic you usually get popular. The key here is for the people to be attracted also by the things you say and do, not only the pretty pictures. And, while I appreciate the pretty pictures, I know tatica quite well and if I was an ambassador and able to vote for FAmSCo, she would be my top choice too. It seems that we have an informant among us :). contest you would of won by far. Dear friend please find out that you're a traitor :D.
you were right with your assumption ;) - thanks for your vote! 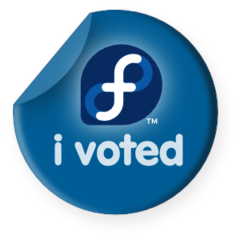 @jsimon: I didn't vote for FAmSCo, since I am not an Ambassador, but the outcome is pretty much as I expected.